In 2014, Brendan Gaughan returns to full-time NASCAR Nationwide Series competition after competing as a regular in the NASCAR Camping World Truck Series last season. This year will mark Gaughan’s third season competing under the Richard Childress Racing banner and first full season in the RCR No. 62 South Point Hotel and Casino Chevrolet Camaro. 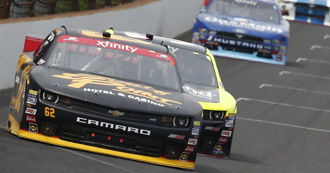 In 2017, Brendan Gaughan returns for his ninth NASCAR XFINITY Series season following a berth in the inaugural XFINITY Series Chase, advancing to the Round of 8. This marks Gaughan’s sixth year with Richard Childress Racing and fourth in the No. 62 South Point Hotel and Casino Chevrolet Camaro. Crew chief Shane Wilson also returns for the fourth-straight season atop the pit box to lead Gaughan and the South Point Hotel & Casino team. In 2016, the 41-year-old driver accumulated four top-five finishes and a career-high 16 top-10 finishes, leading him to a 12th-place finish in the XFINITY Series driver championship point standings. 17 career wins, 10 pole awards, 83 top-five and 136, top-10 finishes and two series championships spread out among the NASCAR Spring Cup Series, NASCAR Nationwide Series, Camping World Truck Series, NASCAR K&N Pro Series West and NASCAR Grand-Am Rolex Sports Car Series. Divemaster for Lake Norman Scuba in Mooresville, N.C.
Ventured to other sports in college and joined the Georgetown Hoyas men’s basketball team as a walk-on player, played from 1994-1997 with NBA greats such as Allen Iverson, Othella Harrington, Don Reid, Jahidi White, and Jerome Williams. Recorded first Nationwide Series pole and career-best finish (second) in his first full season in 2009. One of three rookies to finish in the top 10 in the Nationwide standings in 2009. Finished fourth in 2003 Camping World Truck Series standings; led series with six wins. Won NASCAR K&amp;N Pro Series West championship in 2000-01. … Counts eight career West victories. … Voted series' most popular driver in 2001. … Off-road racing champion with legendary Walker Evans and won the first race he entered at age 15. … Seven off-road titles, including three consecutive Short-Course Off-Road Drivers Association World Championships, from 1991-98. … Member of the Georgetown University Hoyas basketball team from 1993- 97, earning two Big East championship rings, two trips to the "Sweet 16" and one to the "Elite Eight" in the NCAA tournament during his career. … Also a member of the Hoyas football team and was an All-Conference performer. … Holds Business Management degree from Georgetown.